UPDATE: Exit polls published on Dec. 7 for assembly elections indicate that the Congress Party might be doing significantly better than had been expected. Does Narendra Modi continue to have pulling power over a vast section of India’s 900 million electorate? That is the big question in assembly elections taking place in five states, led in importance by Madhya Pradesh, Chhattisgarh and Rajasthan where the BJP is in power. It will then be the central question in the general election due by April and May next year. This would mean that Modi does still have that pulling power, though probably not to the same extent as in 2014 when he became prime minister. If this is correct, the Bharatiya Janata Party could emerge from the current polls in a strong position to be reelected nationally next year, the question then being how big a majority it could secure. 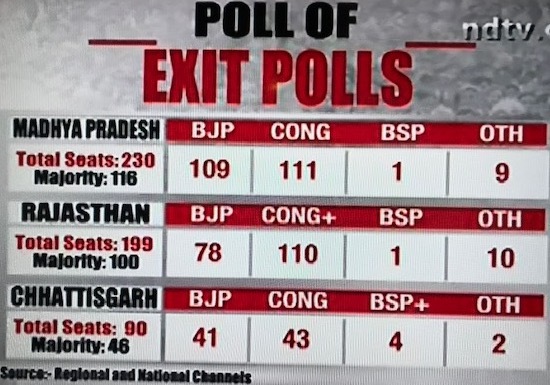 Opinion polls are indicating a close result in Madhya Pradesh and Chhattisgarh, but the position should become clearer when exit polls are published on Dec.7 after voting ends. The count will take place on Dec. 11. Support for Modi would not mean that he is seen as the savior he was in 2014, but that there is no other national leader who inspires trust among voters. There is no sign that the opposition parties, which are now coming together for the general election, will coalesce around one politician. The leader of the Congress Party historically has had that role, or has at least been a kingmaker, but its president, Rahul Gandhi, does not have the experience or authority to do either. Were it not for Modi’s dominant personality and image, Congress and other opposition parties should now notching up victories. The government has not met the targets, expectations and hopes that Modi flamboyantly set in 2014, partly because of a lack of improvements in the broad running of the economy. Promises of urgently needed new jobs have not materialized and a raft of economic and social schemes ranging from the Make in India manufacturing campaign to Swachh Bharat (Clean India) have been far less successful than claimed. The BJP has been ramping up Hindu nationalist issues, which are currently focused on the highly controversial proposed construction of a Hindu temple at Ayodhya in Uttar Pradesh on the site of a Muslim mosque. Built on the site of one of the holiest temples, the mosque was demolished by Hindu demonstrators in 1992, which led to widespread riots. The Vishwa Hindu Parishad (VHP), a hardline wing of the Sangh Parivar (family of organization) that includes the BJP, has been pressuring the government to start the long-delayed construction before the election. That would provide a cause to rally the BJP’s Hindu nationalist cadres at election time, increasing communal tensions. A week ago there were mass demonstrations (above) at Ayodhya organized by the VHP and the Shiv Sena, a rival Maharashtra-based party. The economic failures were graphically demonstrated last week when tens of thousands of farmers marched through Delhi protesting the low prices they receive for their crops under government-controlled systems that push them into debt and, for some, suicide. The farmers were demanding better prices and wavers on bank loans. This is a potent issue in the states now having elections, but the government has done little to offset the problems. Economic measures taken over the past two years are still influencing small firms, especially the demonetization three years ago of 86 percent of bank notes that failed in its bid to curb black money and corruption. This was a Modi dream project, but has been implicitly criticized as a “massive, draconian, monetary shock” by Arvind Subramanian, then the government’s chief economic adviser, in a book being published this week. Neatly titled “Of Counsel: The Challenges of the Modi-Jaitley economy,” the book mocks demonetization as “one of the unlikeliest economic experiments in modern Indian history”. The government in late November launched revised economic statistics that conveniently reduced the average growth figures for 2005 to 2012, when the Congress-led coalition government was in power, from a previously announced 7.75 percent to 6.82 percent, which is less than the 7.35 percent average since 2014. This inevitably led to accusations that the government was fixing the figures to win votes by playing down allegations that growth was hit by demonetisation and the introduction of a new general sales tax. The government claims the figures are based on “internationally accepted standards” but its argument suffered a setback on November 30 when the growth figure for the last quarter dropped to 7.1 percent from a high of 8.2 percent earlier this year. In the current elections, the key contests are in Madhya Pradesh, where the BJP has been in power for 15 years with the same chief minister, Shivraj Singh Chauhan, and in Rajasthan and Chhattisgarh. The other states are Mizoram in north-east India where Congress rules, and Telangana that used to be part of Andhra Pradesh where a regional party runs the government. Madhya Pradesh is seen as the bellwether for Modi. But a line is emerging in the media – presumably pushed by Modi’s team – that he and Shah would not mind losing Madhya Pradesh and Rajasthan because neither Chauhan nor Raje are from their hardline Hindu nationalist wing of the BJP. Raje’s aloofness from Modi is widely known. Chauhan would gain stature if he won for a fourth time and could prove a challenge for influence inside the party, though he has confined himself to his state since Modi emerged as the party’s national leader.